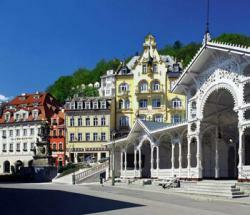 Karlovy Vary, better known by its German name, Karlsbad, is the most famous Bohemian spa. It was named for the Bohemian king and German and Holy Roman emperor Charles (Karl) IV who allegedly found the springs in 1358 during a hunting expedition. In the 19th century, royalty came here from all over Europe for treatment. Among the rich and famous who visited Karlsbad are Goethe, Schiller, Beethoven, Chopin, and even Karl Marx. On arrival in Karlovy Vary, you can purchase one of the specially made, straw built in, cups as shown by Catie and taste the mineral water coming from the well placed springs along the river. Becherovka, the special liquor at Caties feet,is also made in this town. If you would like to do a tour of the liquor factory, let us know and we will built it into your tour. The city is located about a 2 hours scenic drive west of Prague. On arrival in Karlovy Vary, visit the famous Moser Factory and see how this beautiful glass is made. Then we take you on a walk along the “Park Colonnade” and the river “Teplá”. There are over 60 mineral springs ranging from 10oC to 73.6oC (50oF - 165oF). 13 of these springs are located along our route and you can sample them all, if you like. Depending on your level of walking ability, we take a hike up the mountain to spectacular views of the city, visit the beautiful Russian Orthodox Church of Peter and Paul, the baroque church of St. Maria Magdalene and more. Have lunch in one of the many restaurants right on the Teplá River.